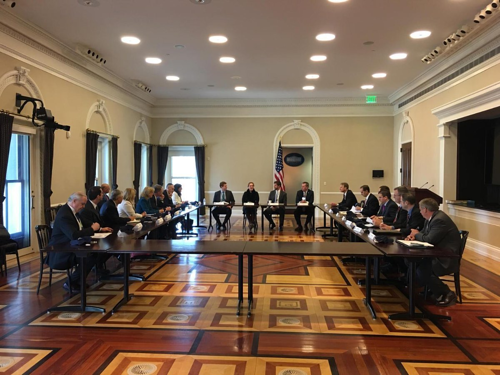 NEW YORK--(BUSINESS WIRE)--Acting upon an invitation to share knowledge and insights on the issues facing the U.S. manufacturing industry, Thomas President and CEO Tony Uphoff recently visited the White House to lead a manufacturing roundtable with government officials and business leaders. Thomas, the leading provider of product sourcing, supplier selection and marketing solutions for industry, has served and advocated for the industrial sector since 1898. Held on Thursday, March 14, the roundtable was organized by the White House Office of Public Liaison, Department of Commerce International Trade Administration (ITA) and the Small Business Administration (SBA). In kicking off the discussion, Uphoff outlined the current sustained growth of the U.S. manufacturing industry, measured in terms of output and job growth, noting employment levels in the sector are on par with those in 1949, during the height the post-WWII industrial boom. Uphoff also touched on four key challenges facing the industry: the public’s misperception of U.S. manufacturing; the digital transformation of industrial sales, marketing and supply chain management; international trade trends and the dynamics presented by today’s multi-generational workforce and its growing skills gap. Uphoff was joined by four Thomas customers: Karen Norheim, Executive Vice President of American Crane & Equipment Corporation; Ken Carlton, President of Corrugated Metals; Sean Duclos, President of Millennium Precision LLC; and Eoin Lynch, Executive Director, Sales and Marketing, Tex Tech Industries; as well as industry leaders: Jeff White, Partner at the law firm Robinson & Cole LLP and Brett Silvers, President and CEO of WorldBusiness Capital, Inc.
Government officials in attendance included representatives from the Congressional offices of Congressman Tom Reed (R-NY), Co-Chair of the House Manufacturing Caucus, Congressman Lee Zeldin (R-NY), SBA Regional Administrators Wendell Davis and Steven Bulger, U.S. Department of Commerce ITA Deputy Assistant Secretary for Manufacturing Ian Steff, and U.S. Department of Commerce International Trade Administration Director Anne Evans. As an early adopter of new technologies throughout the company, American Crane & Equipment Corporation has created a competitive edge. “Our digital transformation has allowed us to grow while at the same time providing ways to modernize our internal culture and create an environment for the multi-generational workplace,” explained Norheim. Working internationally has helped Corrugated Metals grow. “The key to doing business overseas is building relationships. Through these alliances you build increased sales. More businesses should investigate this global opportunity,” said Carlton.